Note: These plans consist of a booklet of 27 pages of text, drawings and photos on 8.5" x 11" pages plus 5 - 18" x 24" drawings. The printed version is black and white. 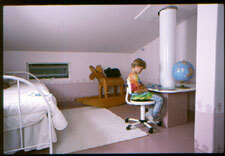 The PDF files for instant download have color photographs. To save $25 and postage costs choose the download option below. 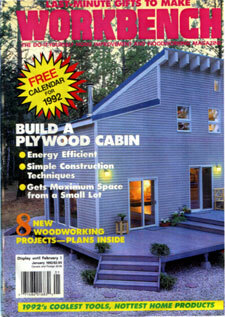 the Plywood Cabin first published in Workbench magazine, designed as a modular owner-built home with a core module around which could be added any number of options including bedrooms, garage, sunrooms, workshops, etc. 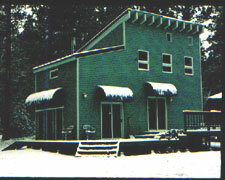 The original cabin had no basement, which would have been a substantial improvement particularly for utility placements. The core module was small and designed to sit on a small footprint which made it useful for building lots as narrow as 25 feet. The sunroom/greenhouse was an experiment but we needed sunspace and at about 4000 feet in the Bitterrot Mountains of Montana we needed all the light we could generate through the long winter months. 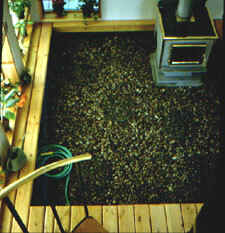 A wood stove was installed in a corner of the sunroom and a gravel floor which could be washed down with hose when muddy dogs or wet boots left tracks. 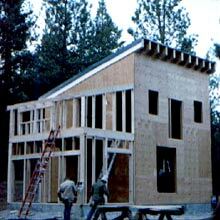 Wire shelving was installed on the inside against the triple pane Low-E windows and was used to start plants. Let me say that I love the design and the unique incidentals that you've worked into the cabin/home.